Some Maryland homeowners have once again put on a Halloween-light spectacular. 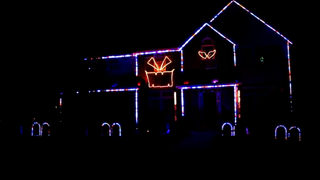 Every Halloween and Christmas, the owners of the house on Ice Crystal in Odenton, Md., catch everyone’s attention with their carefully choreographed light show. And this year, the light show is set to one song that many people just never want to hear again. In order to get the full experience of the house—because, of course, they wouldn’t think of disturbing their neighbors with the song and visitors all night—you have to first send a message to the Facebook page for the address. Once you arrive at the house, you have to turn your radio station to 98.5 FM to listen to the music. The light show, which runs through Halloween, starts at dusk and ends at 9 p.m. One can only imagine how expensive their electric bill is by the following month.